There’s no better proof that quake-stricken Bohol is slowly getting back on its feet than moves showing it is back to welcoming tourists to its many attractions. Although the viewing deck on top of one of the Chocolate Hills was destroyed, a recently opened tourist site provides a vantage view of the famous Bohol landmark, an assessment of SuperCat ferry operator 2GO showed. 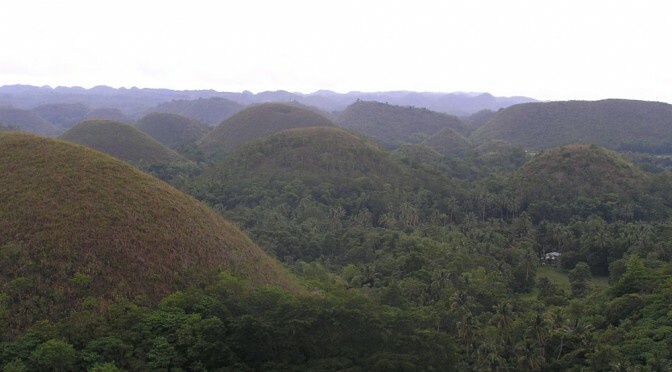 This new site that has recently joined the list of Bohol attractions is called the Chocolate Hills Adventure Park. It is a nature park with a coffee shop and a serpentarium. Since some roads and bridges were damaged or destroyed during the quake, the way to Chocolate Hills will be through a longer route from Tagbilaran passing through Balilihan, Catigbian, Sagbayan, and then Carmen, according to the 2GO report. One of the more popular Bohol attractions is Panglao, an island known for its white sand beaches. It is only slightly affected by the recent earthquake. Except for one or two, Panglao resorts have resumed operations, stated the report. The Panglao Island tour as well as the aqua sports activities may now be availed of by tourists. The Tarsier Sanctuary in Corella has been spared from damage and is open to visitors. One of top Bohol attractions is the tarsier (Tarsius Syrichta), an animal that only measures about 4 to 5 inches. It is considered the world’s smallest primate and belongs to the more primitive sub-order Prosimii or prosimian that dates back 45 million years. A visit to the Philippine Tarsier Foundation’s Tarsier Sanctuary in Corella is in support of the campaign to preserve this primate as all fees go to this cause. The Loboc River Cruise has also reopened as of October 24, 2014. An important heritage structure, the Baclayon Church, was damaged and is closed to tourists. The museum is also still closed but may reopen once there are fewer aftershocks. Other Bohol attractions that are back in operation: firefly tour in Abatan, Pamilacan Marine Life tour, and Balicasag Island excursions. The Cambuhat Tour, D.A.T.E. Catigbian Adventure Tour, and E.A.T. Danao are still not accepting visitors over safety issues. The 2GO assessment report said these are scheduled to reopen by the end of the year. 2GO is taking a group of writers and bloggers on a countryside tour of Bohol on Sunday to show that the province is ready to showcase its many attractions once again.